As Tropical Storm Florence slowly moved west through South Carolina on Saturday, bringing rains and continued flooding that prompted more rescues in the Carolinas, some residents who had fled their homes returned. At least nine people have died because of the storm, which came ashore in North Carolina as a Category 1 hurricane on Friday morning, authorities said, and officials warned that the danger is not over. "More people now face imminent threat than when the storm was just offshore. I cannot overstate it: Floodwaters are rising, and if you aren't watching for them, you are risking your life — even in places that don't typically flood," North Carolina Gov. Roy Cooper said. The Coast Guard said that 20 to 30 people were rescued Saturday from a subdivision near Jacksonville, North Carolina. 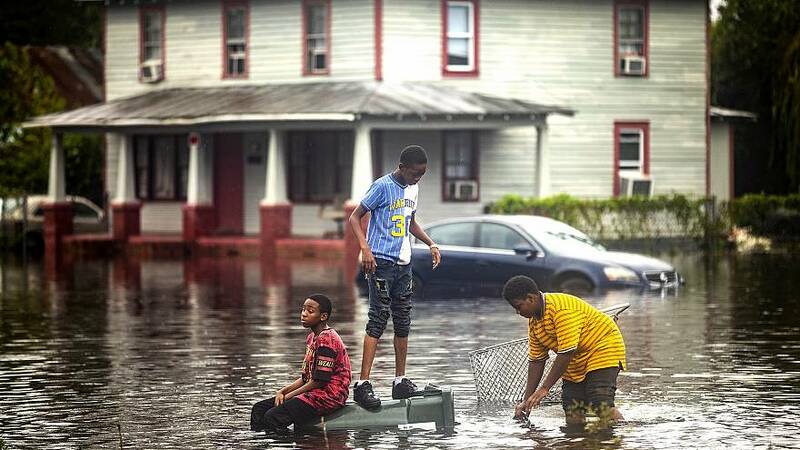 In the town of New Bern, north of Wilmington, there was heavy flooding and hundreds of water rescues Friday and Saturday, town officials said. Tonya Moore, 34, evacuated New Bern with her family before the then-hurricane hit land. She was able to walk back to their home Saturday to retrieve their car, blankets, food, water and clothing. She said she doesn't know how her neighborhood in the town of 29,000 will be able to rebuild. "I don't see how possible it is," she said in a phone interview with NBC News on Saturday. "There's a lot of damage. It's horrible. It's so sad." Moore said she saw trees down on top of houses and cars, and saw neighbors trying to remove debris and water from their homes. There were more than 700,000 power outages across North Carolina as of 6:43 p.m. Saturday, according to the state Department of Public Safety. In South Carolina, National Guard Adjutant General Bob Livingston said many residents followed evacuation orders. "They did not put the rescuers or themselves in danger," he said at a Saturday news conference. "So we appreciate that great cooperation." 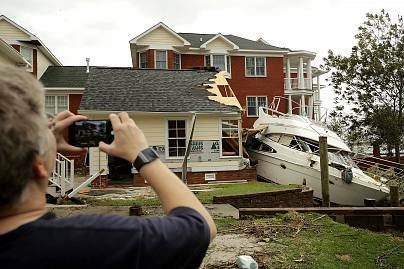 Brittany Michelle Robertson, 27, who waited out the storm in Myrtle Beach, South Carolina, said she and the trailer park that the family manages was spared destruction. "We were out today cleaning up debris," Robertson said, adding that some trailer park residents were returning and none had significant damage. "Some things are starting to open back up." "While most homes experienced minor shingle and siding damage, there is an extensive amount of homes with damage from falling trees and high flood waters," county officials said in a statement. "This rainfall will continue to produce catastrophic flash flooding and prolonged significant river flooding," the hurricane center said in a 8 p.m. bulletin. "We cannot stress enough how dangerous the road conditions are," police tweeted Saturday afternoon. "To the people who have evacuated: If you are safe, stay put," he said. New Bern said in a statement Saturday that 455 people were rescued from Florence's floodwaters and that the operation was completed. The city thanked rescuers and volunteers who they said saved lives. "It's been one of the worst ones. I've been here for years. I never heard of anything like this before," she said. "It's crazy. I've never seen anything like this before."